Testicular cancer is one of the most prevalent types of cancer that occurs in men from ages 15 to 34. Approximately 95 percent of testicular tumors stem from germ cells. 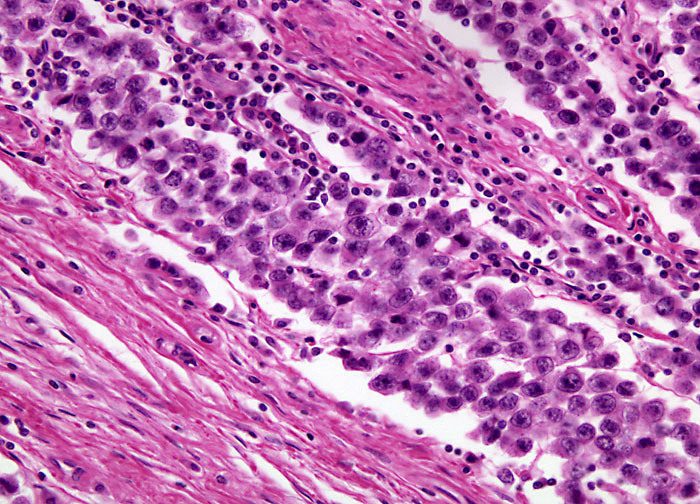 Seminomas, which are widely considered to develop from the germinal epithelium of the seminiferous tubules, account for approximately half of all germ cell tumors. Seminomas are malignant, and though at one time they were usually fatal, advances in the medical field have ensured that the vast majority of patients fully recover. Treatment may involve the surgical removal of the affected testicle, but studies show that the tumors demonstrate remarkable sensitivity to both chemotherapy and radiotherapy. The exact treatment utilized for a particular patient varies based on the stage of the disease, general health of the individual, and a number of other factors, but oftentimes those with advanced seminoma are provided with combination therapy.